Image of the Week #33: "Just Like Brother Wears!" 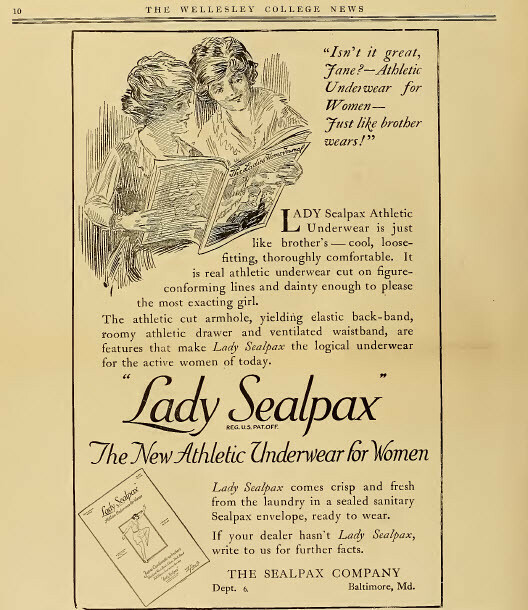 It's fascinating to see what shows up in early ads and in this case, "Lady Sealpax" has "Athletic Underwear for Women--Just like brother wears!". I'm impressed with the aspirations towards being like men (though not in the sense that it is applauding the male idea, but just in the idea that it is saying women can be more than feminine). I'm also curious how long this particular campaign--women as equal to men--stayed the norm for Sealpax after World War I ended and in which publications such ads were effective. I'm dubious that such a campaign was as effective in Ladies Home Journal as it might be in this women's college newspaper, wherein readers might actually participate in sports.